Spend enough time in the woods and sooner than later, the sounds of the outside world fade as surely as dust settles onto a dirt road. Away from the hustle and buzz of amphetamine cityscapes and freeway lullabies that soothe the tired souls of nine-to-five armies, there still exists a semblance of wilderness, far removed though it may be from the lives of most. Twenty miles from any paved road, where wild turkeys and pigs roam free, one of last years’ biggest sleeper albums was penned in the shadows of North Carolina’s towering pine trees. 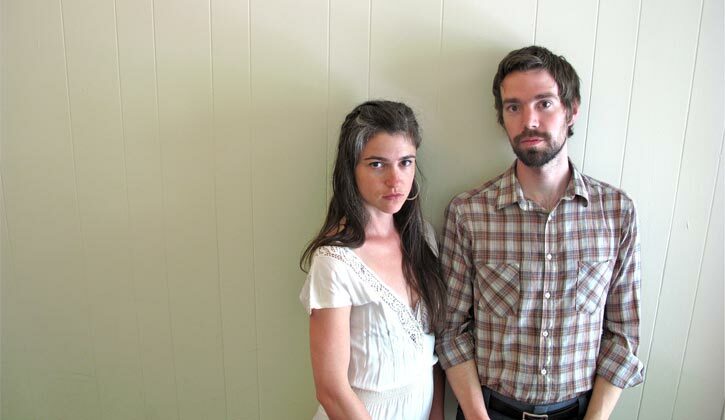 Bowerbirds’ Hymns for a Dark Horse espouses the rustic folk antiquity of the not too distant Appalachian Mountains, with a genuine yearning for the natural surroundings that inspired its creation. “It was a drastic change,” says Phil Moore, singer and guitarist on his decision to take a job tracking the Plaintive Warbler for the North Carolina Museum of Sciences. As part of the assignment, he also began living in a small cabin with his girlfriend — accordionist and visual artist, Beth Tacular. In fact, it’s difficult not to be moved into sorting through the neighbors’ trash for recyclables. Hymns is a rare album that manages to skirt the serious without drowning in the wake of its own proselytizing. The result is an expression of sincere concern for our accelerating human trajectory, delivered without a trace of irony. Rooted in the earthy tones of some lost part of America, Bowerbirds remind listeners — domestic and otherwise — of the responsibility we all share for the lands we call home. These are not the protest songs of the ’60s, but a mature reflection on the power of music to affect real change. Of course, the couple’s aesthetic extends beyond mere art and into more tangible aspects of ecological awareness. They live, as Moore describes it, “semi-off-the-grid,” in the woods about an hour out of Raleigh. Their silver Airstream trailer only recently received running water after being without for a year. For electricity, they use a solar panel and battery, and are in the process of re-assembling the pieces of an old tobacco barn to build a home to call their own. “We’re taking our time,” Moore says of the progress. “But we’re still connected to people,” he is quick in adding, being sure to remind me of the cell phones we’re talking on, all while the melodic chatter of birdsong chirps clearly from his wooded retreat. The re-release of the band’s debut will include a vinyl pressing which features two previously unavailable tracks. In a world increasingly dominated by digital media, it’s a welcome reminder of music as something real and tangible — a physical entity unto itself. At least until that inevitable digital takeover, which seems to loom on an ever closer horizon, more widespread distribution for Hymns through Dead Oceans will allow Bowerbirds to step out of the woods so that they can better reach the urban masses. With plans to have the follow-up to Hymns finished by July and a national and European tour to come shortly after that, Bowerbirds will be forced to leave the relative safety and solitude of their forested home for lands abroad. In spite of the obvious environmental costs of traveling, their message is a message with a timeliness that couldn’t be more necessary. An increased awareness of the consequences of our actions and of the impact each individual makes in his or her everyday life, whether it be with regards to vehicles or simply food choices, is a lesson we all might be wise to heed. “We try to keep track of Whole Foods across the nation,” Moore says, doing his unintentional best to leaven his environmental concern to mythical proportions. Yet, he doesn’t sound the least bit pretentious when he says it. As artists, as musicians, as humans on this madly spinning world, Bowerbirds stand in stark opposition to a status quo that would rather ignore the problems of this world than spread a genuine message of change. Maybe it doesn’t require an environmentally-minded group of musicians from the woods of North Carolina to shake us from our destructive stupor, but the chorus of birds calling plaintively from those very forests would probably agree that it surely helps.